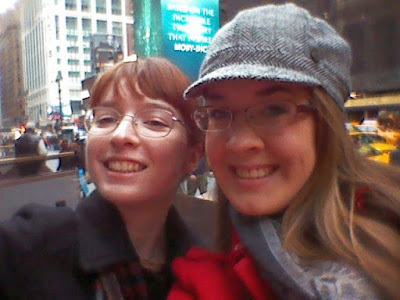 Here's Older Daughter and her dear friend GG, who finally connected in the Big Apple. It was Older Daughter's first excursion into the city. Older Daughter's difficulties in being so far away from home are greatly eased by the closeness of GG. They're only a couple hours apart by train. These two girls have practically grown up together and their friendship is a treasured thing. Incidentally Older Daughter said people could tell in a moment they were not "native" to New York City. I blame their country clothes and country manners -- and believe me, that's not a criticism! I'm glad they have each other. What an adventure! May the Lord bless and keep them safe. We escaped NYC in 1984 and it has not gotten better since. We still have family and friends there, but thank God we no longer live there. Perhaps their smiles gave them away. Nah. Wouldn't do it again if they paid me. I'm glad they were together, and safe. I don't think you could get me into NYC with a shotgun nowadays. I didn't care for it before 9/11. Never mind now. Oh, NYC is not bad at all. Nothing to worry about.